Do Equity Hedge Funds Really Generate Alpha? According to Barclay Hedge, the leading database supporting the hedge fund industry, excluding managed futures, assets in hedge funds have grown from $500 billion to $3.5 trillion during the 15-year period from 12/31/2002 to 12/31/2017. This article will analyze the major source of returns which comprise the Barclay Hedge Fund Index (“BHFI”) during that time frame. There are 14 different categories of benchmarks that are listed by Barclay Hedge. The risk-adjusted returns of the index are primarily determined by equity hedge fund strategies and strategies correlated to equity hedge funds. I estimate the index has between 80%-90% of its risk allocated to equity strategies or strategies that are highly correlated to equity strategies. Hedge funds, as represented by the BHFI, can effectively be viewed as equity replacements. Further, the proper benchmark for equity hedge funds is target volatility strategies. I will use the BHFI and two of its sub-categories, Barclay Equity Long Bias Index (“BELBI”) and Barclay Equity Long Short Index (“BELSI”) to represent equity hedge funds. There are three issues I will address in this article. First, The BHFI provides little diversification to traditional long-only equity indexes due to its high correlation to the equity market. Second, equity hedge fund managers do outperform traditional equity indices on a risk-adjusted basis. This may or may not be surprising to some, but it was surprising to us. Third, I hypothesize the reason for this outperformance is hedge funds engage in a risk premia strategy called intertemporal risk parity. Other terms for this are called target volatility and constant volatility. In other words, this outperformance by BHFI over long-only equities can be also attained by using target volatility strategies. That is, target volatility equity strategies outperform long-only equity strategies by a similar amount as equity hedge fund strategies outperform long-only equity strategies, once fees are equalized. When lower fees are applied to target volatility strategies they, therefore, outperform hedge funds. The best benchmark for equity hedge funds is not long-only equity indices but target volatility equity strategies. I am not aware of any studies which have discussed these three topics in an integrated fashion. If my combined hypotheses are accurate this will have a significant impact on how one should view the performance of Hedge Funds. It is generally assumed that hedge funds offer diversification relative to the equity market. This can be true, of course, depending on what investors combine them with. What is surprising, however, is how highly correlated the BHFI is with long-only equities. 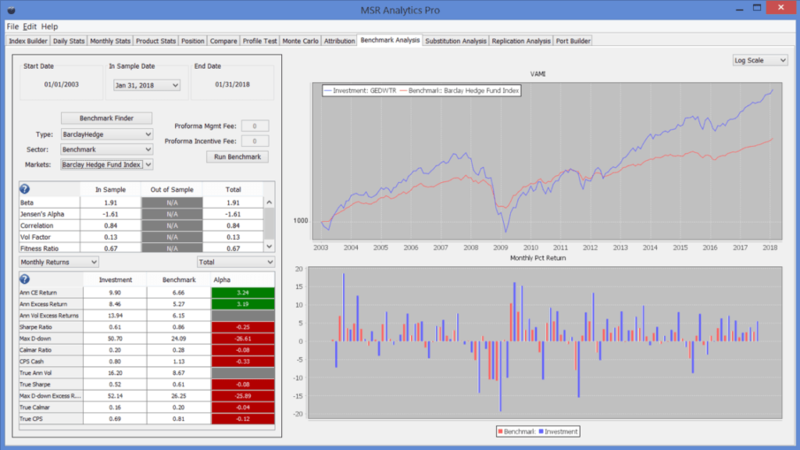 I first compared the MSR Global Equity Dollar Weighted Total Return Index “GEDWTR” to the BHFI. The GEDWTR consists of seven equally notionally weighted futures contracts (SPX, NDX, DOW30, FTSE, EUROSTOXX30, DAX, Nikkei). These are the most traded equity futures indices and consist of allocations of about 43% U.S., 43% Europe and 14% Japan. The GEDWTR is a traditional long-only equally weighted total return index which reinvests dividends and is rebalanced daily to maintain equal notional weightings among the seven equity futures markets. The monthly correlation between GEDWTR and BHFI is 0.84 and the annual correlation is 0.94. Chart 1 provides a comparison of a variety of performance statistics, some of which may be unfamiliar. I will discuss the meaning of “True Sharpe” a little later in the article. “CE” means cash equivalent, or total annual return; the “Calmar” ratio means annualized return divided by maximum drawdown over the time frame measured; excess return is total return less the risk-free (RF) rate; and “CPS” is the sum of the Calmar ratio and Sharpe ratio. I also use the term “true” Calmar. The true Calmar does uses excess returns above the risk-free rate in the numerator rather than total return. Steve Bannon & Kyle Bass: Is Corporate USA Funding The Chinese Communist Party? Why Is Growth Outperforming Value By So Much?